“Happy Death Day 2U” is an archetypal horror movie sequel: it doesn’t offer anything new to the series, but recombines familiar elements in an exciting enough way to justify its existence. What it lacks in creativity, “Happy Death Day 2U” makes up for with unexpectedly heartwarming moments and pure fun. The Christopher Landon film opens in theaters on Feb. 13 and follows Theresa “Tree” Gelbman (Jessica Rothe), a college student at the fictional Bayfield University, as she tries to escape a series of time loops a la “Groundhog Day.” This is Tree’s second experience with time loops. The first film, “Happy Death Day,” centered around her roommate Lori Spengler (Ruby Modine) repeatedly murdering her while disguised as Bayfield’s mascot, a giant baby. The previous film ended when Tree pushed Lori out of their second-story window, killing her and seemingly closing the time loop. “Happy Death Day 2U” concisely ties up loose ends from its predecessor. The film explains the power outages throughout Bayfield and justifies why Dr. Butler (Charles Aitken) had a baby mask in the first film. Its explanation for the time loops, while uninspired, offers closure to the original’s biggest lingering question. Unfortunately, the film’s clumsy opening poses more questions about the nature of its parallel worlds. “Happy Death Day 2U” picks up with the murder of Ryan Phan (Phi Vu), the roommate of Tree’s boyfriend, Carter Davis (Israel Broussard). Ryan is murdered by another “Babyface killer” which snaps him back to the start of the day, locked in a new time loop. At first, it seems that Ryan’s attempts to escape these loops will be the film’s driving force, but, unfortunately, this is not the case. Ryan quickly uncovers the identity of the new killer, but this discovery is entirely nonsensical and is quickly forgotten by the characters and the hitherto fascinating opening is squandered. In escaping his killer, Ryan activates his experimental machine, lovingly dubbed “SISSY,” which the characters identify as the source of the time loops. SISSY releases a blast that sends Tree into a parallel universe where she relives the perpetual birthday from “Happy Death Day” once again. The differences in this alternate timeline make the film feel fresh despite returning to the exact setting of its predecessor. It’s disappointing, however, to see this regression to familiar ground after the film appears to promise more of Ryan and Carter, characters who never had the spotlight in “Happy Death Day.” In the new universe, Tree is left wondering how to get home while the new Babyface killer, distinct from the one hunting Ryan, hunts her down. The identity of this new killer is revealed in the final act, but it fails to surprise or meaningfully contribute to the plot. 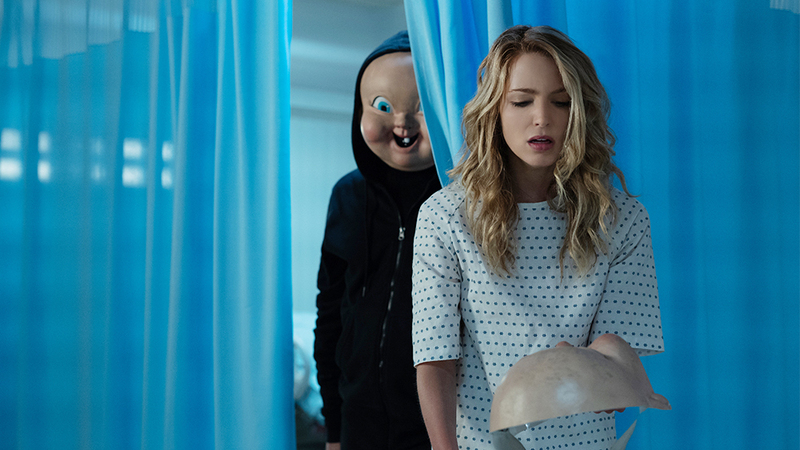 It’s disappointing to see the reveal handled so tactlessly after the effective, unexpected twist in “Happy Death Day.” However, Tree faces off with the killer in an inventive and satisfying encounter that somewhat assuages the pain of the reveal’s shortcomings. The Babyface killer feels like an afterthought, mostly irrelevant to Tree’s main goal of fixing the mangled timelines. The time loops themselves are treated as the antagonist, yet fail to be threatening. After each death, Tree comes back weaker. This attempt at raising the stakes is just as unsuccessful as it was in “Happy Death Day,” as no real consequences come of Tree’s deterioration. Tree’s emotional journey was at the heart of “Happy Death Day,” and she remains a compelling protagonist in the sequel. Her emotional arc is astoundingly genuine for a film that often relies on cheap jumpscares and canned jokes. Tree learns that she cannot change the past without giving up the future, and Rothe’s performance hammers in that lesson with emotional weight. Tree is also consistently funny, although the film’s other jokes are mostly hit or miss. Her blase attitude toward her own deaths makes for several laugh-out-loud moments. One of the film’s best scenes is a montage set to Paramore’s “Hard Times” wherein Tree repeatedly kills herself in increasingly gruesome ways. The film toes the line between horror and comedy, but fails to excel at either. Its repetition of familiar plot beats is typical of a horror sequel, but it lacks any real horror. I’m reluctant to even classify “Happy Death Day 2U” as a horror movie. The only time it slips into the horror genre is during a few jump scares. It’s slightly more successful as a comedy, but doesn’t go far enough. Many of the jokes land and none fall so flat as to stall the film in its tracks, but the film’s inconsistent humor makes it impossible to praise as a comedy, even when it nails the occasional joke. Samar Ghosh (Suraj Sharma) and Anna Pech (Sarah Bennani) join the series, but have little to offer. Samar and Anna seem to be intended as comedic relief, but fail to deliver any funny jokes. They have little plot relevance; their only role is helping Ryan to develop SISSY. Dean Bronson (Steve Zissis), the dean of Bayfield University, is similarly ineffective. He’s completely unlikable and only exists as an explanation for why Tree can’t be sent home immediately as he tries to sabotage Ryan’s experiments. These characters feel half-baked and ultimately only take up space on the screen. While it’s easy to fixate on the bad in “Happy Death Day 2U,” it’s still an enjoyable film. It’s not overly ambitious and delivers more of what was successful in the first movie. It also adeptly mixes lighthearted moments — even while killing off its cast of characters — with emotionally compelling ones. Despite retreading familiar ground, “Happy Death Day 2U” delivers everything that made the first one great. The film doesn’t take itself too seriously but still delivers a few heartfelt moments. If there is a third installment, hopefully we can escape this loop and explore some new settings, characters and plot twists.